In Tortuguero National Park, where the endangered green turtle nest, you'll visit Tortuguero Village, overnight in an eco-lodge and get a close look at jungle vegetation and wildlife during a guided boat tour. At Arenal National Park there are hot springs, an night at a spa/hotel and plenty of activities including rafting, either float or white water. At Manuel Antonio National Park you'll enjoy a guided tour of the park including the white sand beaches and the rain forest where you might see such wildlife as sloths, monkeys, iguanas, and a multitude of insects and birds. This tour is a great introduction to natural Costa Rica. Highlights of Costa Rica. Tortuguero where the endangered green turtle nests. Arenal Volcano Area, hike old lava flow trails and relax in natural hot springs. 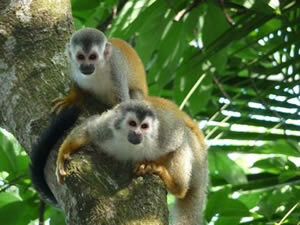 Manuel Antonio National Park, the jewel of the national parks of Costa Rica. Day 2: Tortuguero : Early morning land and boat transfer to Tortuguero, passing through Braulio Carrillo National Park. Arrive in Tortuguero in time for lunch. Afternoon visit Tortuguero Village. Day 3: Tortuguero National Park by Boat: This day, you have a guided boat tour of Tortuguero National Park to get a close look at the jungle vegetation and wildlife. Day 7: Manuel Antonio National / Sunset Cruise : This morning guided tour of Manuel Antonio National Park with beautiful white sand beaches, emerald waters and rainforest with lots of wildlife such as sloths, monkeys, iguanas, and a multitude of insects and birds during this informative walk. Afternoon enjoy a fablous sunset while cruising catamaran style. Day 8: Depart Costa Rica : After breakfast, your driver will transfer you back to San Jose for an afternoon flight home.